Michal Kwiatkowski (Team Sky) crossed the finish line of the second stage at the Vuelta a España in the second position. Despite not winning the stage, the rider climbed to the first position of the General Classification. Kwiatkowski took the leaders' jersey after a battle on the final metres of the stage with Alejandro Valverde, in which the Spaniard showed to be the strongest at the last moment. "It’s not the way I wanted to take the jersey, I was hoping to win the stage," he commented. "The team were amazing ahead of the finale but Valverde was very impressive. In his country, when he races La Vuelta, it’s not easy to beat Alejandro. "It’s a bit disappointing but I’m the leader of La Vuelta. I’m happy about yesterday and about my shape today. Let’s stay focused and try to win another one. I just want to celebrate this moment. La Vuelta is really long so I want to enjoy tonight and then racing in the red jersey tomorrow." The Pole wants to enjoy the moment and avoid making long-term plans now that he has the Red Jersey. 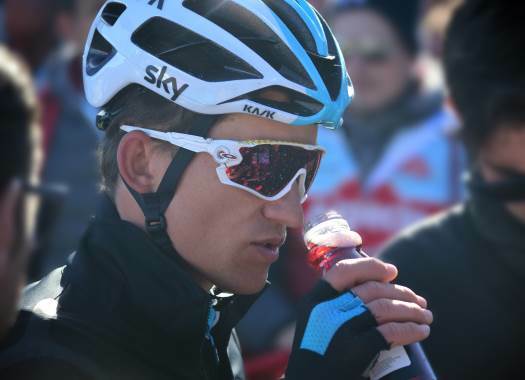 "The Vuelta has just started and we have to play it smart with the whole team," Kwiatkowski said. "(Think about) how we're going to race and what is the opportunity to bring success to Team Sky. It doesn't mean only on the GC. We have to be flexible and take what is there, whether it's with David (de la Cruz), Tao (Geoghegan Hart), Sergio (Henao) and any other riders."